OK, the purpose of this post is to give you details on how and where you should be spending your money on social media video advertising. It is so cheap and effective. Some of these sites you have heard of before, but I’m willing to bet that most of you really have no idea how to run social media video ads on them. I am going to tell you how. If you haven’t already done so, make 2016 the year that you supplement your social media marketing with video ads. For starters, video ads on popular social media channels are optimized for mobile users. As a good digital marketer, you already know the importance of reaching people in your target market who are using mobile technology. That’s because the majority of digital media consumption takes place on digital apps. Another reason to start using video for advertising is because it’s more engaging than traditional text. If a picture is worth a thousand words, then a video is worth a million words. If done right, a great video ad can be worth a million dollars. Here’s how you can run video ads on the popular social media channels. If you’re serious about social media marketing, you probably don’t want to overlook the most popular social media site in the world: Facebook. Fortunately, Facebook also offers video ads. Video ads on Facebook are great because they appear just like video content posted by a user’s friends. You can think of them as native ads on social media. Here is an example of native content video ads. 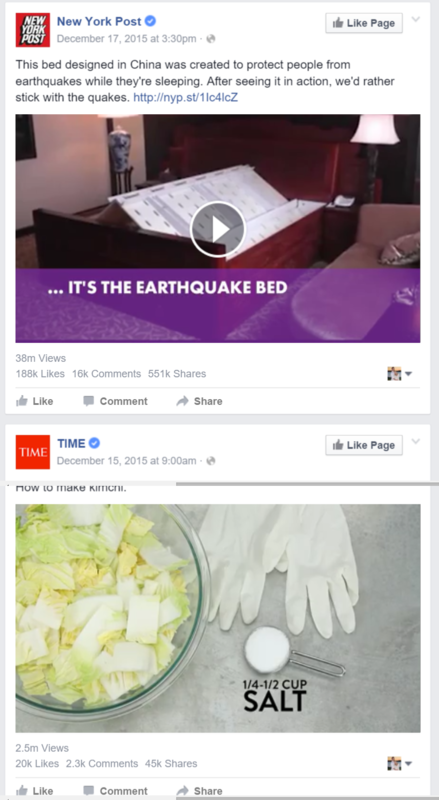 Video ads play just like any other videos on Facebook. If there’s any interest, people who see your video can watch the whole thing or continue scrolling through the news feed. If you’re familiar with advertising on Facebook, then you already know that you can target your ad to users based on one or more characteristics, such as demographics, interests, connections and location. You can target video ads in exactly the same way. Video ads also give Facebook users multiple options for engagement. They can “Like” your Facebook page, visit your Facebook page, “Like” the video, comment on the video, share the video, and/or click a “call to action” button (“Shop Now”, “Book Now”, etc.). As with all other advertising on Facebook, you’re also offered a flexible schedule for running your ad that’s in line with your budget. You can spend as little as $5 per day to get your video in front of the right audience. Many people don’t think of YouTube as a social media channel. However, it facilitates online relationships with back-and-forth dialog just like any other “real” social media site, so it’s certainly earned the title. However, YouTube is much more than a social media site. It’s not only a video sharing site, but also the second-largest search engine in the world next to its own adoptive father, Google. That’s why it’s important that a social media marketing campaign include YouTube. It should surprise nobody with a pulse rate that YouTube supports video advertising. After all, the site became an Internet giant because it hosts videos. YouTube video ads are offered in two major categories: skippable and non-skippable. The skippable ads are called TrueView in-stream and are preferred by many marketers because they’re considered a cost-effective way to reach people who are willing to engage with the brand. TrueView in-stream ads are the kind that display the “Skip Ad In 5 Seconds” message in the lower, right-hand corner of the YouTube video that you really want to watch, but are going to have to wait at least five seconds before you can do so. They’re preferred by marketers because YouTube only charges the advertiser if the viewer doesn’t skip the ad and watches the video for at least 30 seconds (or watches the whole video, if it’s shorter than 30 seconds), or if an engagement is made. It’s widely believed that only people with a genuine interest in the brand will continue watching the video and so the expense for TrueView in-display ads is money well spent. The trick for TrueView in-display ads is to make the first five seconds captivating so that viewers will want to watch the whole ad. Think of it as a challenge similar to creating a clickbait headline. Non-skippable ads are less popular, but also available with YouTube. They force the viewer to watch the whole thing. Many marketers avoid using them because the perception is that they’re a nuisance like TV ads. As with Facebook, you get the opportunity to set your own budget with YouTube video ads. Twitter is a great medium for communicating a marketing message in 140 characters or less. However, you can also use Twitter for video advertising. Although Twitter is often viewed as a text-based platform, it also supports images and video. It’s likely that people haven’t exercised Twitter multimedia advertising to its fullest potential yet. If you’re familiar with Twitter ads, then you already know about the concept of the promoted tweet. Essentially, you pay Twitter to display your tweet to a targeted group of users. Twitter also offers a promoted video option. It’s another great way to reach people in your target market. Promoted videos are also cost-effective because with the cost-per-view (CPV) model, you don’t get charged unless the user who sees the video actually plays it. Also, don’t forget that Twitter video ads have a less expensive kissing cousin. You can use Vine to promote your brand with a six second video that people see as they’re scrolling through their timeline. If you think that six seconds is too short, then check out these stories about how some brands have used Vine for marvelous results. Instagram is a godchild of Facebook, so it’s not surprising that the social media platform offers video advertising as well. What’s also not surprising is that Instagram video ads look, feel, and act a lot like their Facebook counterparts. They also look like natural Instagram content, with the exception that a “Sponsored” tag that appears in the upper, right-hand corner. You can target your Instagram video ad to a specific audience based on various demographics, such as gender, country, and age. However, it should be noted that mobile video ads in Instagram aren’t supported for a variety of platforms. That will certainly change in the not-too-distant future. For now, though, if you’re looking to target a mobile audience with video ads, consider using another social media channel. If you’re offering a product or service that will appeal to millennials, give serious thought to video advertising on Snapchat. According to Snapchat, more than 60% of U.S. 13-to-34-year-old smartphone users are Snapchatters. The platform serves up more than 5 billion video views every day. Wouldn’t it be great if one of your ads was among them? Users see video ads in the “Recent Updates” section. They have to tap it to play it, and tap again to skip it. That means advertisers can know exactly when people stopped playing their video. That kind of analytics can be useful in making videos more engaging. Snapchat also offers something that’s sure to appeal to mobile marketers: full-length vertical videos for devices that are used in portrait mode. That means your video doesn’t have to be a horizontal production that gets shrunk to fit into a portrait-oriented smartphone. Instead, you can produce a video that’s meant for vertical display on the device and fills up the whole screen. According to Snapchat, vertical videos have a completion rate that’s as much as nine times greater than their horizontal counterparts. As of this writing, Snapchat targeting is limited to gender, age, and country. So, if you’re looking for a highly targeted set within the millennial population, you’re going to have to wait or look elsewhere. There are other video advertising options besides the ones listed here. You can run animated GIFs on Pinterest, in-app video ads with Vungle, or video promotions with ad networks like AppLovin. Whatever source you choose, follow the standard rules regarding split testing and always evaluate your analytics. Find out what works best and ditch what isn’t converting for you. With a little bit of experience under your belt, you’ll soon discover that video ads can do a lot to build your brand. This one goes on bookmarks. I’ve been planning to start with facebook video ads, but it will happen after NY. Great content john! Thank you, very happy to help. I have been having a lot of fun with the video ads. I am sure they will be great for you too. Great post with many tips. Thanks! As a part of the promoted pins beta and using Instagram to promote our products using popular hashtags in our niche(wedding photography branding). I feel we are ahead of the curve on social media marketing and it has paid off. We are now testing Heyo Cart as a part of our strategy on Facebook to attract new customers and drive FB engagement. We will soon be able to have all of our followers purchase digital goods straight from their feeds without having to leave the platform. We will be using Hootsuite to schedule these posts. Carol, sounds like a great strategy. The marketers who take the time to dive in fast are going to have big wins here. Sounds like you are one of them! Thank you for sharing an informative post. Social media sites are doing really great job to improve every business. They are certainly making it easier for businesses to reach customers. It is a great age for social media marketers. But think about 5 years from now, wow~! I think the list stops at YouTube, but that is just me.